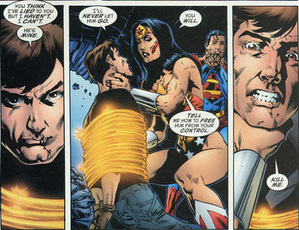 If rumors making the rounds yesterday are true, the Justice League movie's plotline will be a hybrid of elements from the JLA comic book story arc known as The Tower of Babel, written by Mark Waid; Greg Rucka's OMAC Project mini-series and the Superman: Sacrifice four-part storyline written by Mark Verheiden, Gail Simone and Greg Rucka. As such, it would deal with Maxwell Lord (who rumor has it director George Miller wants played by Mel Gibson) gaining control of a satellite placed into orbit by Batman as a means of keeping track of his fellow Leaguers after a perceived betrayal. Using this information, Lord learns all that is knowable about each member, and uses that information against them. As things progress, Lord -- who can manipulate the minds of others -- gets control of Superman and sends him off on a mission to kill Batman. 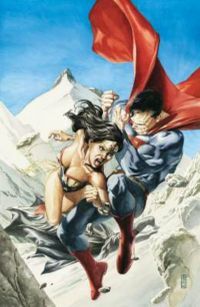 Wonder Woman is determined to stop the Man of Steel no matter what it takes -- even if she has to murder Lord as a last resort. If this does indeed turn out to be the inspiration for the film, one would imagine that the last third of the scenario would be adjusted so that it would be the rest of the Justice League who have to somehow stop Superman from achieving his goal. In a sense, then, does Superman become one of the villains of the piece? DAVID NUTTER ON DIRECTING "THE SARAH CONNOR CHRONICLES"
EXCLUSIVE: Just the sheer notion of turning the Terminator film franchise into a weekly television series seems overwhelming, but in this exclusive interview with director David Nutter (who has also helmed the pilots for Smallville, Roswell, Dark Angel, Jack & Bobby, Traveler and numerous others), he previews the mid-season series The Sarah Connor Chronicles and provides some hints as to the show's direction. Dark Commandos ("DC") is a live-action Internet series about a team of vampires working as an elite covert assassination and special ops unit for the United States government. Naturally this is a highly secret group. Their identities and very existence are known only to a handful of top brass, and their orders come directly from the Oval Office. NON GAGE: Known simply as "Non", he is the leader of the Undead Brigade. Though he appears to be a man in his early thirties, he is actually over 500 years old. His story has never been told in full, but his file indicates that he was a Knight fighting during the Crusades when he was turned into a vampire. He served the vampire who had turned him for several years, until, sickened by the man's unrelenting brutality, he fled, and survived on the run for the next several centuries. An unexpected meeting with his progenitor -- whose ability to hold a grudge was unparalleled -- resulted in Non being forcefully buried in Austria in the mid 1800s, and left there -- presumably forever. During World War II, forces of the Third Reich discovered Non's amazingly preserved body and brought him to Adolph Hitler's top secret "Theosophic Research" facility. There, Nazi scientists sampled Non's blood and endeavored to use it to create an undead army. Their experiments produced some hideous false starts, but Hitler's vision was still unrealized when Non was "rescued" by a team of American Commandos. Non was brought to the United States, where a deal was offered to him. 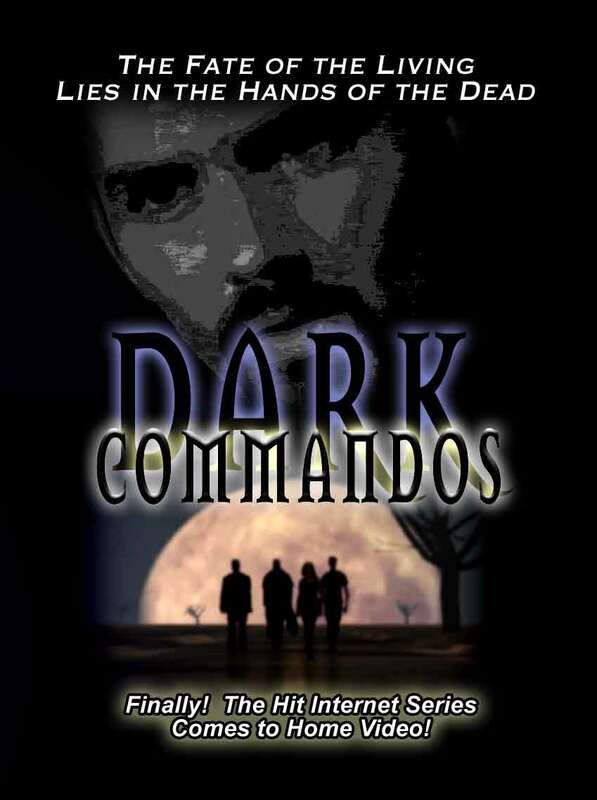 In exchange for the promise of an anti-vampire "cure" if one could be engineered from his DNA, Non would create and lead a team which would become known as the Dark Commandos...a supposedly more noble American incarnation of the Nazi plan to deploy vampire soldiers. Despite what he is, Non remains a decent and spiritual man, who amazingly continues to practice his Catholic faith. On the one hand, Non would love nothing more than final death, but in the back of his mind is the fear that he would be denied entrance into the Holy Kingdom. The alternative is too frightening to contemplate. Information on additional members of the team, as well as more episodes, will be coming soon. Jessica Biel has auditioned for the part of Wonder Woman in Justice League, and gut instinct says that she is exactly the kind of actress the producers would go for – though as a complete sidenote, that possibility raises into question director George Miller’s desire for an older cast. Which, in turn, bring up that whole Tom Welling question again [see previous posts]. “I think the challenge is to get beyond the idea of ‘action movie’ and create a character in a movie that’s a real person, not just an action person who’s tough,” Biel said in reference to her role in the third Blade film, though on some level she could have been talking about Wonder Woman. “I want to go past the genre. It’s what I felt about Texas Chainsaw Massacre. I wanted to do something that people will look at and not just go, ‘Oh, it’s a horror movie, it’s nothing.’ It was the most difficult creative challenge of my life, and it was a horror movie. And nobody really gives the credit to a horror movie It’s so difficult.” Warner Bros. will not comment on whether or not Biel auditioned until it's ready to announce the film's entire cast. AN INTERVIEW WITH KEVIN CONROY: FROM "BATMAN" TO "JLU"
The voice of actor Kevin Conroy helped define the character of Batman for fans of the animated Dark Knight beginning in the early 1990s with Batman: The Animated Series, and right through the final episode of Justice League Unlimited. In the following interview conducted back in 2004 shortly after it was announced that Conroy would not be involved with The Batman, the actor reflects on his journey in the role. 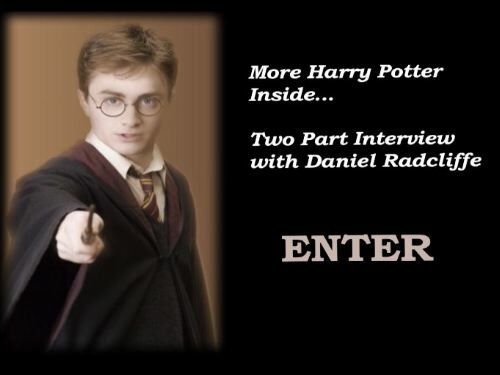 WARNING: There's a bit of sound distortion in this interview and it's recommended you lower the volume of your computer slightly before playing. According to Dark Horizons, Justice League will begin a three-to-four month shoot in Sydney, Australia starting in mid-February, with (as previously announced) George Miller serving as director. Additionally, with production based in Seattle, Washington for the time being, active auditions are taking place for what is described as "eight-to-nine" leads, among them one role for a black actor (almost a certainty that this is for John Stewart, a.k.a. Green Lantern). Additional details emerging over the weekend include infamous_emijayne's report that the film's budget will be in the area of $235 million, and Obsessed With Film's rumor that production designer Owen Paterson had been brought aboard. Paterson, for his part, has served as p.d. of such films as the Matrix trilogy, V For Vendetta and, most recently, Speed Racer. Although these comments have nothing to do with Justice League, in discussing his craft insofar as The Matrix is concerned, he noted to Daily Variety back in 2000, "I was lucky in that I had a very close relationship with [visual effects supervisor] John Gaeta. We tried to come up with a system where our visual effects and the design were integrated together very closely. And that was a challenge in itself because we had both the real world and we had the matrix." Considering the challenges of combining elements of the JLA (including the Watchtower), it would seem a similar need for synergy will be a requirement on this film. Also like the Matrix, JLA will be shot in Australia, which Paterson noted brought a challenge in itself: "We did shoot on location, but the majority of the stuff was built on a stage. We had a difficult situation that in Australia we don't have the same sort of roof structures that exist in, say, Chicago or perhaps New York. Consequently, shooting on real roofs in Sydney would have been impossible and probably dangerous. So we ened up building all that in a very large shed." In describing his job on a film, Paterson told TheMatrix.com, "I am the production designer for the art department, responsible for taking visual concepts the directors have and turning them in to real environments for the actors and directors to work with." More recently, he discussed V For Vendetta with Digital Cinematography magazine, explaining the challenges of working with the lead character's mask, which required him to somehow bring life to a static image that the mask represented. "I wanted the face, even though it's very distinct, to have a 'universality' to it," he explined. "I knew that if we achieved the right look for the mask, we would be able to tonally and atmospherically change the way it appears on camera through the lighting design and Hugo [Weaving's] performance." Reported Australia's Daily Telegraph, "With recent confirmation that superhero flick Justice League will be shot in Australia, it's no wonder local actors are flexing to score parts in the George Miller directed blockbuster. Top shelf stars -- including Leonardo DiCaprio and Jessica Alba have already been linked to the project, but that's not to say Aussies won't be going for the roles of Superman, Batman, Wonder Woman, Aquaman and The Flash. Sydney actress Victoria Hill is hoping to don some iconic tights after testing for Wonder Woman, reports website Moviehole. The starlet, currently seen in The December Boys, read for the part of the Amazonian princess recently and by all accounts was rather super, so to speak." EXCLUSIVE INTERVIEW WITH DWAYNE MCDUFFIE ON "JUSTICE LEAGUE"
The impression one would get is that the Justice League has become a way of life for Dwayne McDuffie, bearing in mind the fact that he was a producer on the animated version of the team, wrote the video game Justice League Heroes and is taking over the monthly comic from the departing Brad Meltzer. Interestingly, though, that’s not entirely the case, as there is much more to his background and current projects than the League (see links at the end of this interview). 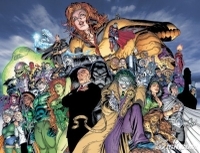 For the moment, though, the subject is the Justice League and this is an exclusive opportunity to get McDuffie’s views on the team and his vision for the comic. JUSTICE LEAGUE ON FILM: Given your involvement with the animated Justice League, writing the video game and now taking on the comic, is there something about the group that appeals to you? DWAYNE MCDUFFIE: I like it fine, but I think it’s more happenstance. It’s the show I got a job on and I really enjoyed working on it, but I was never a Justice League reader before that. I think since I got the job I’ve read almost everything, but it’s all catch-up. I’m a giant fan now, but I was offered the game because I did the show and I got offered the comic because I did the show. I’ve been writing comics for almost 20 years before I’d ever been offered it. JUSTICE LEAGUE ON FILM: Is your experience on the show influencing the comic at all? DWAYNE MCDUFFIE: The characters between the two are not similar beyond powers. It’s a different world. On the TV show, we pretty much controlled the universe; what we said happened, happened. In the comic, I may want to use a character, but he’s on the moon in another book or something, so it’s constantly adjusting to the flow. You’re part of a much bigger tapestry. The thing about the Justice League comic is that in a way you’re at the center of that tapestry, because it’s where everybody meets. In many ways that makes it more difficult.